Netflix – humble or arrogant about competition? Netflix Q3 2018 results show the company isn’t encountering any meaningful competition at all. The company doesn’t see it that way. At one moment it says it is losing to competitors most of the time and at another, it sees no foreseeable competition. If the company keeps up the pace, it will have over 60 million U.S. streamers and 87 million international streamers. It is entirely possible Netflix could exceed 150 million streamers by years’ end. What does Netflix think about its competitive situation? If we believe the conflicting statements made by the company as part of the third quarter 2018 results, Netflix is either losing badly to the competition or not encountering any meaningful competition at all! Netflix representatives are overly humble in saying “we lose most of the time.” It is correct, but it creates a false impression. The average Netflix household streams more than an hour every day from the service. 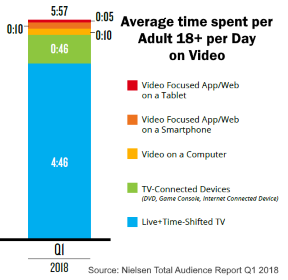 Nielsen says that the average adult spends 5 hours and 57 minutes per day watching video. Of that, 4 hours 46 minutes is live plus time-shifted television, and 1 hour and 11 minutes come from connected TV, smartphone, and tablet viewing. In Netflix homes, the service dominates every other video source except live and time-shifted television. In other words, no other service out there is out-competing Netflix for a consumer’s money. It is very hard to argue with this statement. For example, in the UK 78% of SVOD homes have Netflix, 22% do not. To be fair, Mr. Hastings isn’t necessarily arrogant here. He has long maintained that just because someone subscribes to Netflix doesn’t mean he or she won’t also have one or more other services. Lending credence to this opinion is the fact that the average US SVOD subscriber now has 2.8 services. So, today it is fair to say that Netflix isn’t competing with Hulu or HBO Now for a share of a consumer’s monthly entertainment spend. Consumers have the flexibility to afford 2 or 3 of the services if they want them. However, to say competition for wallet-share is very far off doesn’t seem right either. Next year, Disney will launch its highly anticipated direct-to-consumer service. It will deliver top content, some of which is currently available exclusively on Netflix. Disney will not be the only TV brand launching in the next year or two. 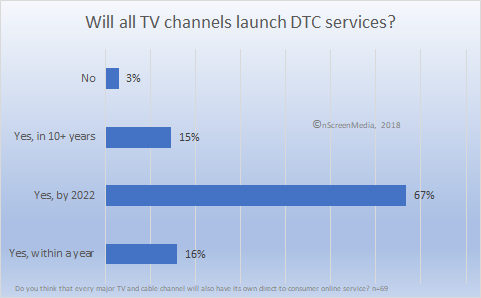 In a recent survey of media executive, nScreenMedia found that nearly three-quarters expected every TV brand to launch a direct-to-consumer service by 2022. Consumer wallets have finite limits. 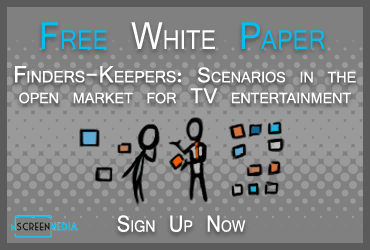 Moreover, with many more quality SVOD services arriving soon, the limits are likely to be reached within 2 to 3 years. By 2022, Netflix will be feeling real wallet competition. Netflix is not encountering any meaningful competition in the market today. Though the company maintains it is losing out to competitors, it is only behind linear and time-shifted TV. The company says it doesn’t see any competition for wallet share for a very long time, but that will arrive within two years.